The Russian Defense Ministry, Foreign Ministry and Ministry of Industry and Trade have presented their own report on chemical attacks in Syria in the wake of a UN-OPCW document, which accuses Damascus of using chemical weapons in Khan Sheikhoun on April 4. The Russian Foreign Ministry has stated that the risk of crimes related to chemical weapons use outside the Middle East is high. "According to our assessment, the risk of chemical crimes spilling outside the borders of Syria and Iraq is very high, and even outside the Middle East such incidents could start taking place — in Afghanistan, in Russia, and in Western Europe." Russia has voiced strong opposition to the use of chemical weapons, emphasizing that those guilty in such crimes should be brought to justice. Claims that Russia is allegedly encouraging chemical weapons' use in Syria are "hysteria" and attempts to discredit Moscow, the Russian Foreign Ministry has stated, adding that it is unacceptable to blame Damascus for it based on media reports. Moscow believes that it makes no sense for Damascus to use chemical weapons as only the opposition could benefit from it. According to the Russian Foreign Ministry, the UN-OPCW report on the chemical weapons' use in Syria is biased, "unprofessional and amateur." "Of course we expected that the mechanism and the OPCW fact-finding mission would ensure a completely unbiased and a highly professional manner of investigation to decidedly and conclusively establish the guilty party. I shall say straight away that these expectations were not met," the head of the Non-Proliferation and Arms Control Department of the Russian Foreign Affairs Ministry Mikhail Ulyanov said at a briefing. First investigators refused to visit the site of the alleged chemical attack in Khan Sheikhoun in the Idlib province, the Russian ministry has recalled, adding that the probe had been conducted remotely. "The investigation … was carried out remotely in New York and the Hague offices, as well as on the territory of one of the countries bordering Syria. This could not help but affect the quality of the investigation, which turned out to be extremely low." Specialists had previously refused to visit the Shairat airbase, from where the chemical attack was allegedly conducted, according to the claims of Western countries explaining that visiting the airbase was "not a part of their mandate," but still visited the base in October. "But experts categorically refused to collect samples in order to detect sarin saying that they did not have the relevant instructions," Ulyanov said, noting that Moscow suspects "sabotage" in the work of the experts. "Actually, this is a scandal: this is an attempt to mislead the international community," he told reporters. The report into the chemical attack contains words "supposedly," "likely," etc, which mean that the findings of the document can be questioned, according to Moscow. The report blamed Damascus for the Idlib chemical attack based on three claims that 1) a bomb with sarin has been dropped by the Syrian military aviation on Khan Sheikhoun; 2) photo and video from the site; 3) analysis of sarin. According to Russia's findings, a Syrian warplane was in the area, but it was 5 km away from the site and couldn't drop the bomb on the site due to the plane's technical characteristics. Eyewitnesses also didn't see a jet above Khan Sheikhoun, a Russian Defense Ministry official has said, emphasizing that due to these facts it is incorrect to say that a Syrian Su-22 could have dropped a bomb on the town in Idlib. "If the plane had flown on the route which was registered by the United States… it could not have attacked Khan Sheikhoun from a simply technical point of view." Moscow has been calling on OPCW-UN experts to probe whether the Khan Sheikhoin events had been staged but have received a negative response. "The report [by the OPCW-UN] noted that in 57 out of 247 cases of requests for medical assistance, the victims were taken to medical facilities even before the incident took place. The incident took place between 6:45 and 7:00 a.m. [4:45-7:00 GMT], according to the JIM [Joint Investigative Mechanism]. They [57 alleged victims] accessed health services even before that, and these facts are recorded and documented," Ulyanov told a briefing, adding that some of the victims requested medical assistance in a hospital located 78 miles away from Khan Sheikhoun. Based on the way the bomb crater looks, the ammunition that hit Khan Sheikhoun exploded on the ground, the Russian Defense Ministry said. As a Russian chemistry expert has noted, claims of unique characteristics of sarin, which was confirmed to be used in Idlib, are baseless. According to the photos of White Helmets' volunteers, they touched the site with their bare hands, if it was sarin, they would have died. "Look, these people are digging in a shell pit, collecting something there, while they use respirators and cotton gloves as protective equipment, which do not really protect from sarin. Meanwhile, these people, as you can see, feel quite normal, cheerful, healthy. If there was sarin in the shell pit, the picture would be quite different, terrifying," Ulyanov said, commenting on the video. According to Ulyanov, the video gives all grounds to assume that an explosive was first blown up, forming a pit where White Helmets volunteers then carried out their manipulations for camera, and only later were these pits splashed with sarin. "Otherwise, these people would have already been dead… We drew the JIM's attention to this video, but they preferred to refrain from analyzing it and reflecting it in the report." The ammunition shown in the OPCW report was self-made from a water-pipe, according to the Russian Defense Ministry. In conclusion, the Russian diplomat has said that the all findings of the report have been proved to be false by Moscow. 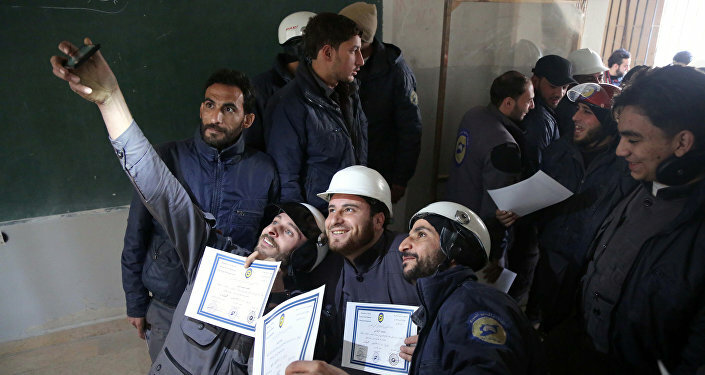 However, Moscow has welcomed that the report agreed that photos made by the White Helmets organization's volunteers who are believed to be connected with al-Nusra Front-linked are fake and staged. The Khan Sheikhoun incident that took place in Syria's Idlib province on April 4, 2017, left 80 people dead and injured 200 more. While the National Coalition for Syrian Revolutionary and Opposition Forces, supported by the United States, immediately blamed the Syrian government for using the chemical weapons against civilian population, Damascus has strongly denied the allegations and reiterated that it does not possess any chemical weapons' arsenal, the full destruction of which was confirmed by the OPCW. Commenting on the accusations against the Syrian government, Russia has multiple times reiterated its position that all chemical weapons were taken out of Syria in mid-2014 with Washington's assistance and called for a thorough probe into the Khan Sheikhoun events. Despite Washington immediately blaming Damascus for the alleged chemical attack even before the probe into it was launched, the US has admitted that terrorists in the country are in possession of such weapons. According to the UN-OPCW report, the government of Syrian President Bashar Assad is allegedly responsible for the use of sarin in the Khan Shaykhun incident, while Daesh terrorist group is responsible for the use of sulfur mustard in Umm Hawsh. The Russian Permanent Mission to the United Nations has commented on the document, stating that the report looked more like an amateur document, and was based mostly on assumptions and the selective use of facts.